GiXo defines four capabilities which complement for the CMO function. Out of Japan, inquiry of causal connection (which means interpret insights to adjust the business.) is contained as a part of roles for the DATA-SCIENTIST same as finding correlation. 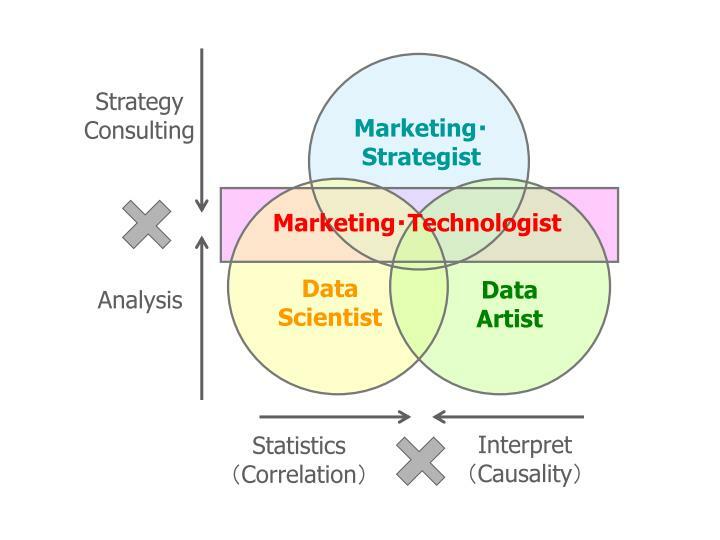 On the other hand, the word of “data Scientist” in Japan is more focused on analysis skill. It conjures only meaning of “An expert of statistics” or “A specialist of tool for data analysis or data base”. Following descriptions are what GiXo defines the data artist. Data Artist is in charge of “create an primary hypothesis and interpret the business insights from results of analysis or verification of the hypothesis.” , As never land such is like tools for statistics analysis find undiscovered insights which people can not aware by itself has not come true yet. As it cannot be valuable suggestion to take the action by results itself normally, to provide meaning (which considers business and state of society. Sometimes need to change the perspective from the numbers or the world of academics.) for the results of analysis is more required. Needless to say that derive correlation such as like “factor A” is correlated significantly with “factor B” can be significant findings but it doesn’t have the insight to adjust the business. The lack of insight will provide you the graphs or tables which you cannot help to ask 「what’s the point?」even it looks dressed up by advanced tools. The capability of the data artist is not the new idea. 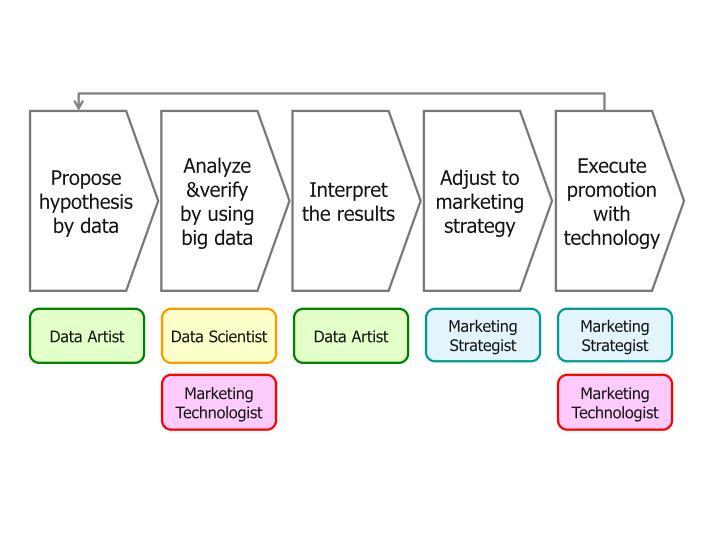 Some of the people who are like management and strategy consultants sharpen these skills as they are the professionals to advance quest for insights from data (=fact) and needless to say, also talented to verify hypothesis by using data. It can be said that the person with the capability of the data artist is valuable for pre-analysis and post-analysis and it’s easy of being trained for the person who have experienced that fields. As long as the service planning department and the consulting firm are required to handle analysis with big data, GiXo is stands for that the data artist who considers “what the purpose of the analysis is for? ” and “how will it be interpret to the business?” will bring out their capability in the department or the firm.